This gentle 6 mile circular walk starts at historic Kenilworth Castle and continues across flat farmland & open countryside, with many attractive views. There are no stiles and the walk is dog friendly apart from some farm livestock. There is a free car park by the Castle, almost opposite the Queen & Castle pub, but if this is full you can also park at the pay & display Castle car park which is located just off Castle Road (B4103) behind Kenilworth Castle, and start your walk from the end of the service road mentioned in the text below. 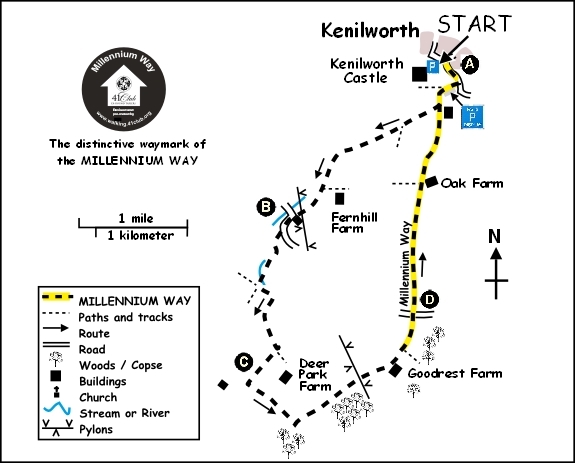 For part of the walk, you will enjoy the delights of The Millennium Way where you will be guided by the distinctive black Millennium Way waymarkers. Find out more about the walk by clicking on the information icon. Park in the free car park opposite Castle Green near to the Queen & Castle pub (dog friendly) or in the pub car park (pay & display). From the lower end of the free car park take the wooden kissing gate and walk around the perimeter path of the castle, climb a few steps to reach the Castle Entrance apporach, then go left to pass the Castle ticket office. Go over the bridge then at the service road go right to pass the Pay & Display car park on your left. Stay on service road, ignoring first footpath lower right, and after some 50 paces you will reach a solitary waypost and see the first distinctive black Millennium Way waymarker. Here turn left and go up the track through short stretch of woodland to reach a wide gap with gate right. Take gap and immediately go half right to take a gate leading onto grassy passage signposted Rouncil Lane 1¼ miles. After approx 150 yards you reach a solitary waypost on right. Here we leave The Millennium Way for the time being to continue straight ahead keeping hedge right. Continue along to take metal gate and exit next field by metal kissing gate. Keep to right hand path and stay with hedge right , then go through gap in corner of field and ahead keeping hedge left. Just before end of field go through metal gate left and continue with hedge left. On reaching hedge corner stay ahead across centre of field to take wide gap in distance. Stay forward across field towards white house, partially obscured by trees, to find and take kissing gate to farm track. Turn right and continue under power lines to reach main road. Stay ahead to pass Brook Cottages on left and where road bends sharp left go ahead to take footpath right through metal kissing gate into field staying ahead with fence left. The track continues between fences eventually to bear left to corner kissing gate. Take kissing gate and bear slightly right through scrub to take wooden footbridge over brook, then through kissing gate to turn left. Keep hedge & brook left. Take next bridge left over brook and then ahead through metal gate and up next field. Take the next gate ahead then turn immediately right along bridleway keeping hedge right. Continue through gated hedge gap eventually to reach field corner. Take metal gate right, under power lines, then follow blue bridleway marker into right hand field to go left and continue on cinder track with hedge left to end of field.. At the end of the field, by large metal gate, turn right along field bridleway and continue with hedge and fence right. Go through corner metal gate and ahead with hedge and fence right to reach field corner gate. Take the gate and go immediately left to continue gently up farm track between trees ahead. Stay ahead on surfaced track, past Deer Park Farm entrance left and when you reach the corner of wood ahead go left through metal gate and continue down wide bridleway keeping hedge left. Eventually pass through large metal gate on left and continue on same line now with hedge right to pass under power lines. 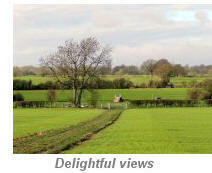 Stay ahead to pass left of farm buildings and take metal gate right following bridleway sign. After a few steps go left and stay along surfaced track leaving Goodrest Farm behind you. After approx 200 yards you will pass a waypost & gate on your right at which point The Millennium Way rejoins our circuit. Do not take this gate, just stay ahead on surfaced track to reach the junction with Rouncil Lane. Go right on lane for 50 paces and take metal gate left. Go with hedge right and wooden fence left to follow field edge cinder track and exit by corner gap. Stay ahead with hedge right to exit via metal gate then ahead with hedge right to end of field. Take metal gate then ahead to pass large farm on right (Oaks Farm) to find corner concrete bridge. Cross bridge to find metal gate ahead. Take gate, then ahead, across field, to take second metal gate. Stay ahead with fence right (ignore kissing gate right to playing fields) to take metal gate then ahead with hedge right to eventually pass dew pond reaching a solitary waypost just ahead. (You have now joined your outward route). Go right here along wide grassy corridor between hedge left and fence right to exit by gate to driveway. Go left down drive taking gate adjacent to cattle grid then along woodland drive and pass car park. Go left towards castle entrance, retracing your steps on the outward route, past ticket office, descend steps on right just in front of castle entrance and continue around perimeter footpath to arrive back at a wooden kissing gate leading to the free car park with the Queen & Castle pub opposite. The architecture of the castle spans the Norman to Tudor periods and in spite of its ruination, it’s a magnificent sight, especially in the evening when the setting sun highlights the red sandstone. In medieval times it was a royal palace, much more important than Warwick castle (now a Tussaud’s theme park, which only ever held a duke). Queen Elizabeth I visited Kenilworth in 1575 as a guest of Robert Dudley, Earl of Leicester. She stayed for 19 days, the longest stay she ever made to one of her subjects, but then Dudley was VERY keen to marry her and spent the equivalent of £4.5 million on entertaining her, with pageants, fireworks, bear baiting, mystery plays, hunting and lavish banquets. One story claims that during her stay she married Dudley in a ‘wicca’ (pagan) ceremony, but nobody really knows the truth. 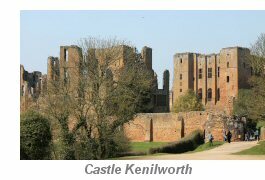 The castle was given to ‘The People of Kenilworth’ in 1958 by the then owner, the son of Baron Kenilworth (Sir John Siddeley of Armstrong-Siddeley automobile fame), and is now managed by English Heritage. 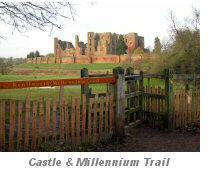 If you are a Kenilworth resident, you have free entry to the castle! 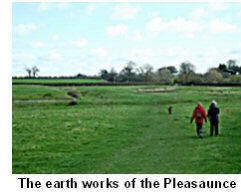 From the castle, the walk takes you through delightful countryside. Deer Park Farm is named after the royal deer park which once surrounded the castle (notice on your Ordnance Survey maps the reference to Park Pale, the boundary of the park on Rouncil Lane. If time permits, having completed the Millenium Way circular, it is worth walking a further 1.5 miles around the castle on the Millennium Trail - details from the castle. You will see stunning views of the castle, pass the Pleasaunce (earthworks for King Henry V’s pleasure house) and ancient lanes.